In an attempt to promote tourism and development, the Russian authorities are investing $1.5 billion to create a special gambling zone in the peninsula. Russian President Vladimir Putin has introduced a bill on the creation of a gambling zone in Crimea to the State Duma, the lower chamber of parliament. The Russian authorities plan to open the first casino on the peninsula toward the end of 2016 and they hope that the gambling zone will become a direct competitor to Monte Carlo, Las Vegas and Macao. From the standpoint of the development of the peninsula, the launch of a gambling zone will help create more than 10,000 jobs in the republic. At the same time, the Russian authorities are counting on attracting foreign investors for building hotels and casinos. The total amount of investment in the first phase is estimated at $1.5 billion, and budgetary funds will be used only for the building of necessary infrastructure. State Duma deputies are ready to support the president’s initiative. “This is really the right decision, and Crimea is just the place for such a zone to work,” Mikhail Yemelyanov, first deputy chairman of the State Duma Committee for Economic Policy, told RIA Novosti. It is still uncertain just where the gambling zone, to be chosen by the Crimean authorities, will be located. According to First Deputy Chairman of the Council of Ministers of the Crimean Republic Rustam Temirgaliyev, the most likely location is the south of the peninsula, which is the part most developed and popular with tourists. In that case, the gambling zone would incorporate 100 hectares (about 247 acres) on the coast. There are currently three sanatoria that are only used two months per year in that area. The other option is a new construction near the popular youth resort of Gurzuf, 2–3 kilometers (1–2 miles) from the Alushta-Yalta highway. The law on gambling zones prohibits the creation of gambling zones in existing cities, but they can be immediately outside the city limits. According to Deputy Igor Rudensky, chairman of the State Duma Committee for Economic Policy, the gambling zone could be created near Simferopol, near the peninsula’s main airport. A gambling zone was created using this principle near Armenia’s main airport, Zvartnots. The Russian authorities are trying to adopt the American practice of building casinos in isolated zones, first and foremost using the example of Las Vegas – the gambling center in the Nevada desert was created far from basic infrastructure. Since 1 July 2009, gambling business has been outlawed in Russia outside the boundaries of four zones. 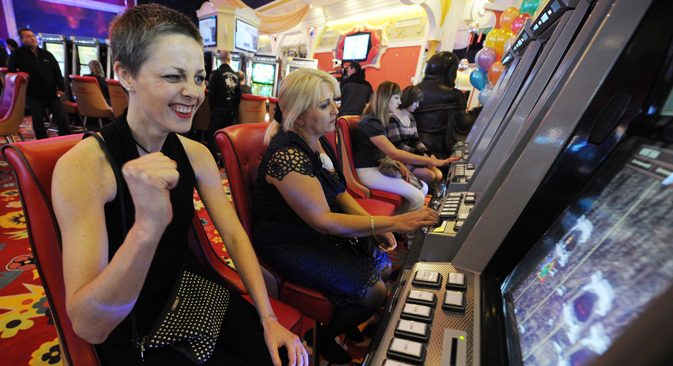 However, so far investors have only been interested in the gambling zone in the Krasnodar Territory. The other three gambling zones - in the Primorsky Territory, the Kaliningrad Region, and in the Altai Territory - are not active at all, and their opening is constantly being pushed back. “The difference in those regions is that they are located in parts of the country that are rather far from airports and infrastructure,” Yevgeny Skomorovsky, managing director of ZIP Realty, told RIR. According to him, from that standpoint, Crimea, which was already an established resort destination, differs considerably from the other zones. After the Winter Olympics, German Gref, head of Russia’s largest bank, Sberbank, suggested opening a gambling zone in Sochi during an interview with the Rossiya TV channel, but the project did not find the federal support on which Gref was counting to speed up the recoupment of investments in hotel construction for the Olympics. At the same time, the Sberbank head’s idea had already received the support of Alexander Shokhin, former Russian deputy prime minister and director of the largest big-business lobbying organization, the Russian Union of Industrialists and Entrepreneurs. In practice around the world, the legalization of gambling business enables the development of large resorts. The most famous example in recent times is Batumi in Georgia, where casinos and the new hotels built next to them through former Georgian president Mikhail Saakashvili’s initiative became a point of attraction for the residents of the neighboring republics. Monte Carlo in Monaco and most of the German resorts built on the water were developed in the same way. In the U.S., besides Las Vegas, there are other examples of successful resort development based on gambling. The Canadian city of Niagara Falls, on the border with the U.S., attracts tourists with its casinos and slot machines. In the American town with the same name, gambling is outlawed, and most of the tourists prefer to stay in Canada.